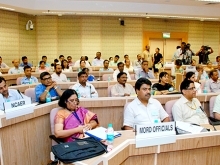 Home » Events » Report on "MGNREGA: A Catalyst for Rural Transformation"
Report on "MGNREGA: A Catalyst for Rural Transformation"
MGNREGA: A Catalyst for Rural Transformation, a report published by NCAER and University of Maryland was released at a function held at the Vigyan Bhawan, New Delhi today. 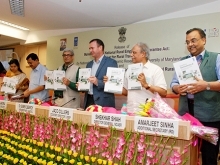 The event organised in collaboration with the Ministry of Rural Development (MoRD), Government of India, and UNDP India was presided by Dr Bibek Debroy, Member, NITI Aayog, Shri Amarjeet Sinha, Additional Secretary, Ministry of Rural Developemt, Govt. 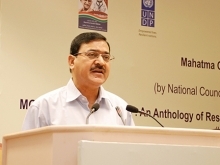 of India and, Shri J K Mohapatra, Secretary, Ministry of Rural Development, Govt. of India. 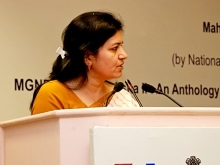 Aparajita Sarangi, Joint Secretary, MoRD delivered the welcome address, followed by remarks from Dr Shekhar Shah, Director-General, NCAER. 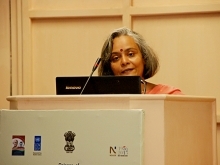 Dr Sonalde Desai, Senior Fellow, NCAER gave a presentation on the report to a house full of audience, followed by an insightful Q&A session. 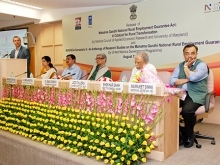 ‘The Mahatma Gandhi National Rural Employment Guarantee Act has been remarkably successful in improving the welfare of workers who participate in the programme. 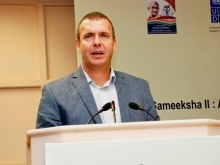 But its reach has been limited due to the lack of work in some of the poorest areas. 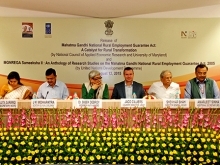 Using unique data from the India Human Development Survey, a large, national survey comprising over 28,000 rural households, conducted twice by researchers from the NCAER and the University of Maryland before (2004-05) and after (2011-12) the implementation of MGNREGA, this report concludes that MGNREGA reduces poverty and empowers women but work rationing limits its impact’. 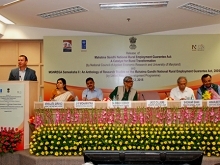 However, the positive effect of MGNREGA is limited by very low access to work in some of the poorest states such as Bihar and Odisha. Only 24.4% of rural households participate in MGNREGA nationwide, and nearly 70% of the interested households cannot participate due to lack of work. Most important, about 70% of households below the poverty line, do not participate. Implementation challenges lie at both the state and the local level. In states with strong programmes, such as Chhattisgarh, nearly 60% of the poor participate in MGNREGA infrastructure projects. Contrastingly, in states with weak programmes such as Bihar, barely 11% of poor households participate. 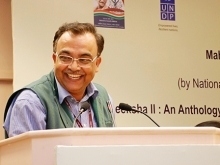 It is particularly important to ensure better implementation at the local level—both to improve MGNREGA access and to improve the quality of infrastructure. 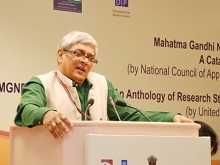 The 6th C D Deshmukh Memorial Lectu..
Aadhaar and its Role in Inclusive G.. 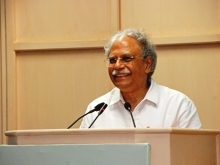 The 5th C D Deshmukh Memorial Lectu..
Shekhar Shah speaks to NDTV..
A TEDx by NCAER senior faculty memb..